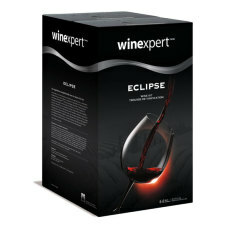 Winexpert's ultra premium wine kits, the Eclipse series are made with the finest quality varietal juice from around the world to produce wines that will satisfy the tastes of even the most discerning wine enthusiasts. The famous thick, gnarled and twisted old Zinfandel vines of Lodi in Californias Central Valley contribute to intense concentrated flavours in the grapes. Fresh aromas and flavors of ripe honeydew melon, crisp green apple and an attractive floral note. This Eclipse Series Sonoma Valley Unoaked Chardonnay is a fresh, well-balanced wine with typical Chardonnay characteristics of tropical citrus aromas and flavors. Medium-heavy in body with a luminous dark cherry colour, tannin dominates the flavours initially, with intense grip and robust dryness in the finish. A delectable blend of Corvina (Amarone), Sangiovese and Barbera grapes, this deep and delicious wine is a delightful new addition to the Eclipse series from Winexpert!